See more, explore more in the land of the Incas! 5 day Inca Trail: A trek to take it easy and enjoy! Staying at campsites that few people use you get to enjoy the beautiful views of the mountains and see the sunsets and sunrises in peace and tranquility. Trekking the Inca Trail is one of those things that everyone should do once in their life and the 5 day version allows you to enjoy it to the full! The 5 day option is highly recommended for group of families or group of friends who wish to spend more time close to each othe avoiding the crowds and pace of the classic 4 day Inca Trail. The 5 day trek is also recommended for older people (60+) who want to take their time and enjoy the trail at an esteady pace. By booking your Inca Trail with Llamapath you are choosing the best treatment for you and your Porters ! To see Permits availability please email us! It is strongly recommended to book your Inca Trail at least 4 months in advance as permits can quickly sell out. Starting Altitude - 2720m / 8920ft. Highest Altitude - 4217m / 13,780ft. Overall Difficulty - Moderate to Difficult (depends on your level of fitness). Very Important: Campsites may vary depending on booking time, weather conditions or on restrictions undertaken for safety reasons by the Peruvian Goverment. Today has a relatively relaxed start for the Inca Trail and the walking is easy going to help you settle in to the trek. Beginning at Km82 we slowly make our way along the banks of the Urubamba River with great views of the snow-capped peak Veronica (5900m / 19000ft) and with a variety of native plant and birdlife around us. We'll have a visit to a small Inca fortress called Vilca Raccay that is off a side spur of the main Inca Trail before heading to our main destination, the extensive Inca site of Llactapata (Patallacta) which is also where we will camp. Today is another relatively easy day. Most groups would be powering ahead along the Inca Trail today and would be heading over Dead Woman's Pass, the highest point on the trek and one of the hardest and longest climbs on the Inca Trail. We're going to take things at a more leisurely pace and our goal for today is a campsite just before the pass, Llulluchapampa, this breaks the hardest stretch over two days making the climb significantly easier. On the way to Llulluchapampa we'll once again go off the beaten track to visit the least visited of all the sites on the Inca Trail, the Inca fort of Paucarcancha. As we climb up to Llulluchapampa we'll pass through various biozones including the low sierra, cloud forest and the high puna. There are many opportunities to see a variety of plant and birdlife and if we are lucky we may also spot White Tailed Deer. Our campsite for the night is at 3800m / 12460ft. and just like before it is tranquil and quiet with most trekkers either camping in the valley below or on the other side of the pass. Today is our longest day and crosses two high passes; luckily for us we're nearly at the first pass and once we've passed the second the walking is easy with very little ups and downs to contend with. Today sees some of the best views and scenery of the whole Inca Trail and includes visits to two Inca sites (Runcuraccay and Sayacmarca); with fantastic views of the high snow-capped peaks for most of the day and the cloud forest all around us today is by far the most visually stunning. Our campsite for tonight is at Phuyupatamarca (3680m / 12073ft) from where we'll get our first views of Machu Picchu mountain far in the distance (the site itself is hidden from view). The views of the sunset from here are fantastic and once again the campsite is quiet with the majority of trekkers camping closer to Machu Picchu. Today is all about the Incas; we visit 3 major sites (Phuyupatamarca, Intipata and Wiñay Wayna) before we finally arrive to Machu Picchu itself late in the day. With only a short distance left to cover you'll really have the opportunity to see these sites in detail and learn more about the Inca culture and Machu Picchu in preparation for your visit tomorrow. The area around these Inca sites is also rich in wildlife and with only a handful of people around on this stretch of trail at this time of day it is the perfect opportunity to try and spot some of the more elusive species. The final stretch of the Inca Trail is completely deserted this time of day so our arrival to Machu Picchu via the Sun Gate (Inti Punku) is perfect. With good light and very few tourists about we can get some great photos to the citadel from a distance before carrying on down. After we arrive to Machu Picchu, we'll head down to Puente Ruinas (the campsite near Aguas Calientes) to be greeted by our porters for our last night camping together. We've made it! Waking up early we'll take the first bus back up to Machu Picchu to enter the site as it opens. We'll have a 2 hour guided tour of the site during which you'll learn about the Incas and visit all the most important areas of the citadel. After your tour you'll have free time to explore the site by yourself and if you have permits to climb either Huayna Picchu or Machu Picchu mountain. In the afternoon you will take the train back to Ollantaytambo from where you will carry on by bus back to Cusco. 4 Breakfasts, 4 Lunches, 4 Afternoon Snacks and 4 Dinners. If you have a dietary request such as vegetarian food please let us know. Prices Include Personal Porter to carry up to 8 Kilograms of each participant. Prices also Include VISTADOME/PANORAMIC 360° train on the way back to Cusco. Student rate: In order to obtain this discount you must have a valid University Student card (and be NO older than 25 YO). It is important you scan and e-mail this to us at the time of booking and that it is valid on the date you are booked on the Inca Trail/alternative trek (you will need to show the real University card upon your arrival here in Cusco and in Machu Picchu). Please Note Inca Trail deposit fee is included in the Price. You can either book by emailing us or by using the Booking form provided on this site. Send us your main Departure date and back up date: By providing us with a main date and a back up date for your trek (classic Inca Trail, Lares, Salkantay, etc) you automatically authorize Llama Path to use either of these dates for your reservation. 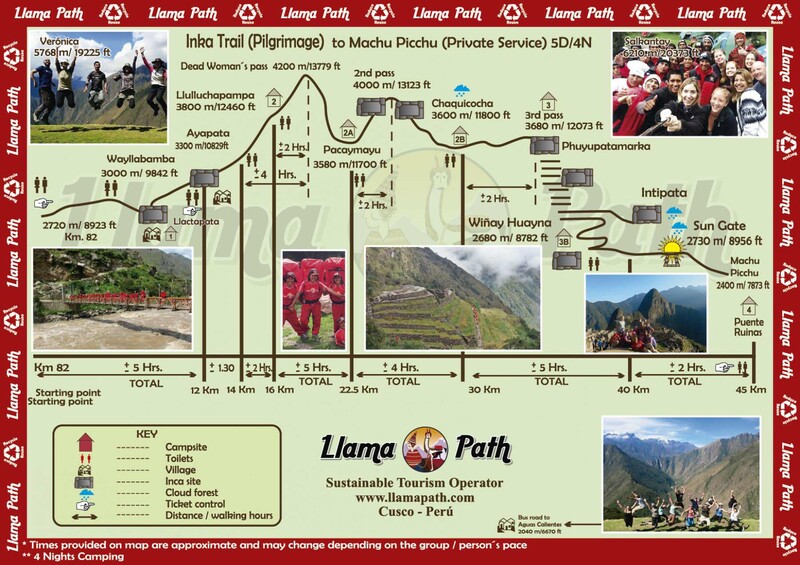 Llama Path within the next 48 hours (after you have sent us your booking form and confirm deposit was made) will send you an electronic receipt confirming your trek has been officially booked and also to confirm the exact departure date of your trek. Payment of deposit: NO Transaction Fees from January 2nd, 2017 !! US$385 per person for the Inca Trail + Wayna Picchu or Machu Picchu climbing. 10 – 11am – this also needs to be specified although you need to be flexible to either time. Please note, if you get the permits for the 7am start you will probably have to miss the Machu Picchu guided tour. 1) Paypal: NO Transaction Fees from January 2nd, 2017 !! 2) VISA Card: NO Transaction Fees from January 2nd, 2017 !! options’ choose VISA Card payment option and follow the instructions. The Local Payment (Final Balance): We require you to pay your final balance in cash (Soles or USA dollars) in our office at least 48 hours prior to tour/trek departure (please advise if you have any delays on arrival). Deposit sent for is Non-Refundable nor transferable to any other date, person or tour (According to Inca Trail and Machu Picchu Regulations).